Just 2 games involving 3 New York Ranger and New York Islander prospects on Wednesday night with 1 prospect taking advantage of his opportunity. It was game 2 of the Subway Super Series with Ranger prospects Anthony Duclair (2013 3rd) and Ryan Graves (2013 4th) playing for Team QMJHL. If you did not know then this series is one of the ways in which Hockey Canada decides who to invite to try to make the annual World Under-20 squad. Neither Ranger prospect was a serious contender to make the team but this is how you can earn that opportunity. In the 3rd period with the score tied at 3-3; lets go to the video tape courtesy of Sportsnet. 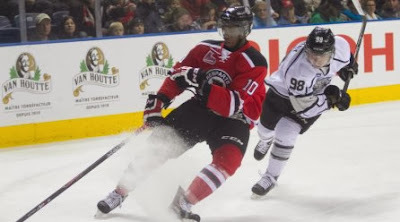 Anthony Duclair is wearing number 10 for Team QMJHL in red. Duclair (1G, +2) was deserving winning goal scorer, since he played with an edge and an energy throughout both games. After Team QMJHL got all of its scoring from the Jonathan Drouin-Charles Hudon-Anthony Mantha line on Monday, it was imperative to get it from different sources. Three lines got on the scoresheet. Ryan Graves did not have as strong a game as he did in game 1 as he was scoreless and a -2 on the night. Ryan Pulock (NYI 2013 1st) earned the game's 2nd star as his Brandon Wheat Kings fell to the Medicine Hat Tigers in overtime 4-3. Pulock had 2 assists and was a +3 on the night but he took a boarding penalty at 19:31 of the 3rd period which gave the Tigers a power play that they cashed in just 32 seconds in the overtime period.